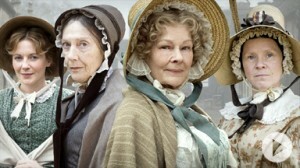 Recently I rented a Masterpiece Classic mini series “Cranford” from Netflix and absolutely loved it. Based on Victorian novelist, Elizabeth Gaskell’s “Wives and Daughters” about life in a small English village sometime in the 1840’s. But even more so it is a story of true friendship between a group of amazing women. Judi Dench is fantastic as Ms. Matty Jenkyns a spinster with a heart of gold and beloved by the entire town. I’ve alway enjoyed her acting but I don’t think I’ve ever seen her in a role more perfect for her. She makes you wish you could be or have a friend just like her. I couldn’t recommend this mini series highly enough. To sweeten things even more there are two more episodes airing right now on PBS. “Return to Cranford” You can also watch the full episodes on the PBS website. If you’re a sap like myself and love tales of friendship, overcoming life’s challenges, love, humor, and fantastic costumes, I’m sure you will love this series as well. If you’ve seen the series or happen to enjoy them as much as I have please leave a comment. It’s so fun to talk with other people who enjoy Masterpiece Classics on PBS as much as I do.